As a global leader of transformation software and services, SNP supports companies in adapting their business models and using new technologies. We aim to advance as a company both in terms of our entrepreneurialism and as people. In recent years, the SNP Group has experienced significant growth and major changes as a result. Not only, but particularly in times of change, a company and its employees must adhere to the principles of integrity, ethics and personal responsibility. The ethical requirements of a company operating globally and across cultures and sectors of society are demanding. In a complex environment of laws, guidelines, social beliefs and our entrepreneurial goals, it is vital that we constantly question our actions and address any possible consequences arising as a result. That also applies to our relationship with our employees. They are our most important resource and the foundation of our success. For that reason, we are dedicated to providing a sound training and education program to be able to utilize their knowledge effectively. In addition, we aim to provide our employees with the best possible working environment. In particular, we invest in their health and support them in achieving a work-life balance. We also foster an open and fair relationship with our business partners, which is particularly important in a market segment as complex as ours. When working with our customers, we strictly adhere to current laws and universal moral and ethical values. Our aim is to set out SNP’s commitment to sustainable actions with which we want to meet tomorrow’s challenges, today. Our strong growth over the years has brought with it a delightful diversity of cultures among our employees. It is important here to be able to rely on a common framework of values. Only through this common approach will we grow into a global community that deals with its employees, customers and suppliers in a respectful, honest and reliable manner. We are committed to protecting the environment in many ways. Our main focus is on energy emissions from vehicles and buildings, waste prevention, and recycling. Our social responsibility increases with our entrepreneurial success. We are committed to this responsibility by advocating for animal welfare and supporting projects in the areas of education, research, arts and intercultural affairs. We also promote sports by acting as sponsor. By promoting diversity in the workforce, we benefit from a genuine competitive advantage. Of particular importance to us are projects in the area of health, especially related to children’s health. The German Childhood Cancer Foundation is the central contact point for families with children with cancer. Here, families are provided information and a professional advice. For example, through social funds, the foundation supports families in financial difficulties. The main goal of the foundation is to make sick children healthy again. In addition, it aims to restore their quality of life and give them the chance of a happy future. The German Childhood Cancer Foundation supports research projects that increase the chances of recovery, make treatments safer, and find new therapeutic approaches. The Heidelberg Children's Hospital is located in the heart of Heidelberg University Hospital. Thanks to the renovation this year, it now has space for more than 200 children and young people. In addition, by the end of 2018, all child and adolescent medicine will be united under one roof, meaning shorter routes and better treatment options. During their stay in the hospital, children and young people are cared for using the best medical means available. Alongside patient and treatment rooms, it provides a play and study area for patients as well as rooms for parents. This ensures that children, young people and their families are as comfortable as possible. Last but not least, the proximity to the university guarantees the latest findings in research and treatment. The German AIDS Service Organization (DAH) consists of about 130 organizations that deal exclusively with the issues of people living with HIV/AIDS. It represents the interests of those affected in the areas of society, politics and research. The DAH aims to educate as many people as possible about HIV/AIDS and other sexually transmitted infections, and thus to act preventively. The organization works closely with the Federal Center for Health Education and specifically addresses the groups of people who are particularly at risk in the hope of making HIV/AIDS increasingly rare in the future. In addition, the DAH supports self-help groups through education and training, information material, and numerous websites about AIDS. 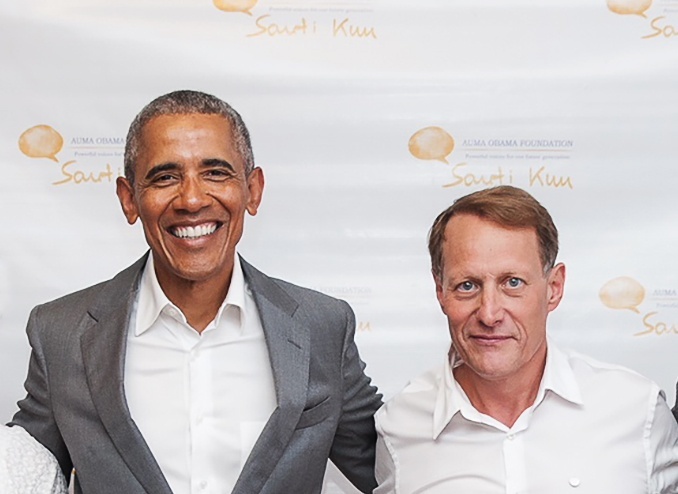 The Auma Obama Foundation Sauti Kuu (Sauti Kuu) is a non-profit organization that was established in Kenya in 2010 and registered in Germany in 2011. The foundation is led and inspired by Dr. Auma Obama, who has extensive experience working with NGOs and young people in Africa and throughout the world. Sauti Kuu (“powerful voices” in Kiswahili) works with disadvantaged young people, particularly those in rural areas, to help them and their families utilize locally available resources to improve their living conditions. Sauti Kuu is working to reverse one of the most economically destructive migrations in our time – rural-urban migration. As part of its infrastructure development program, Sauti Kuu is building a Sport, Resource and Vocational Training Center in Alego Nyangoma, Siaya County, in Western Kenya. The aim is to create a safe and secure physical space for young people from rural areas to meet and interact regularly, while participating in sports and learning activities. The center will offer basketball, boxing, football, volleyball and netball. SNP is delighted to support the Sauti Kuu Foundation in setting up the sports center, as providing the children with new sports facilities is important to us. The picture shows our founder and CEO Dr. Andreas Schneider-Neureither with former US President Barack Obama at the inauguration of the Sport, Resource and Vocational Training Center. Shine’s ambition is to ignite a culture of reading and to instill a love of books, both in the school and in the wider community. The school library was set up with this in mind and is the only decent library for miles around. It provides a valuable resource for the children at the school and the local community. The Shine library is stocked with around 9,000 books, all donated by well-wishers in the UK and US. To achieve its aim, Shine has built its own school called Shine Zambia Reading Academy in the compound of Kalikiliki, Lusaka. The school has 150 pupils and 8 local teachers. It charges no fees, and its focus is to teach illiterate children how to read and write – children whose family cannot afford to send them to school or cannot find them a school place due to oversubscription. Children are enrolled between the ages of 8 and 12. The literacy program lasts for 2–3 years and consists mainly of phonics lessons, English grammar, key word learning, storytelling and guided reading practice. When pupils complete the program and pass their final exams, they ‘graduate’ and Shine places them in nearby government schools directly in Grade 5, 6 or 7 so they can continue in formal, mainstream education.